The Federal Government said on Sunday that it had stocked enough food to address possible shortages in some states in 2018. 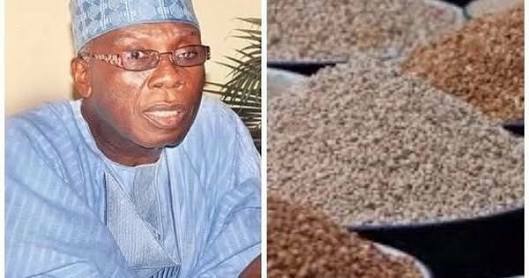 Audu Ogbeh, the Minister of Agriculture and Rural Development, made the disclosure in Katsina. The minister spoke at the Joint International Fund for Agricultural Development (IFAD)/Federal Government 2nd Supervision Mission for Climate Change, Adaptation and Agribusiness Support Forum. Mr. Ogbeh was represented at the event by his Senior Technical Adviser, Auta Appeh. “Some states in North-east and other parts of the country will likely experience low agricultural yield in 2018 due to climate change and weather issues. The minister advised farmers to desist from indiscriminate felling of trees to preserve the environment. Mr. Ogbeh said that cutting down trees exposes soil to desertification, erosion and other effects of climate change that have negative impact on the environment. He said statistics had put the rate of desert encroachment in Nigeria at about 12 miles per annum.